Greeter ministry is designed to assist in providing a warm atmosphere of friendliness and acceptance for all those who come to Crossroad ChristianFellowship Church. 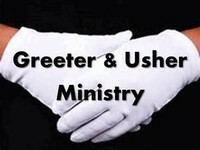 Greeters communicate God’s love for people through a kind word,loving handshake,and sincere, joyful spirit. Ushers will serve the congregation in a Christ-like manner, facilitating the events and the church while aiding all congregation members. This ministry principally works to ensure a smooth operative environment. The responsibilities of the Pastoral Usher include ministering to the needs of the Pastors and Staff as related to service preparation. They will also serve as the stage usher during services and tend to alter related duties as well. Other duties include serving as the Public Liaison for the Senior Pastor when requested. Proverbs 8:34 " Blessed is the man who listens to me, watching daily at my gates, waiting at the posts of my doors."